Raceway is a fun, simple, and low maintenance game. The simplicity of play and lack of mechanical moving parts allows many hours of carefree operation. Game play is simple, the player inserts the required number of coins or tokens and game play proceeds automatically. 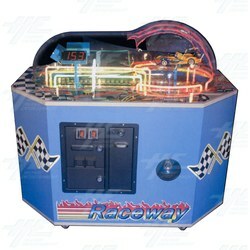 The game prompts the player with the phrase’s like “Welcome to smokin raceway drag strip”, the central neon lights then enter in a “Christmas Tree” sequence, red to green, the sound of screeching tires plays simultaneously as the lights begin “racing” down the track. The object of the game is to “stop” the light with the stop button as close as possible to the “JP” position in order to win the jackpot. When the player “stops” the light the game will prompt with “Nice Run.” Tickets are awarded to the player based on Jackpot options and seven ticket payout tables that are selectable with DIP switches located on the main logic board. located on the main logic board. leaves our factory set up and ready to play. All you need do is plug it in and load the ticket bins. paid out by the machine or the attendant can record the jackpot value and clear it using a switch located below the ticket dispenser. seven payout tables to suit you needs.